The Kuroshio Current and its Extension jet in the western North Pacific Ocean form a dynamic western boundary current (WBC) region characterized by large air-sea exchanges of heat and carbon dioxide gas (CO2). The jet is known to oscillate between stable and meandering states on multi-year timescales that alter the eddy field and depth of winter mixing in the southern recirculation gyre. These dynamic state changes have been shown to imprint biogeochemical signatures onto regional mode waters that can be distributed widely throughout the North Pacific and remain out of contact with the atmosphere for decades. Figure. 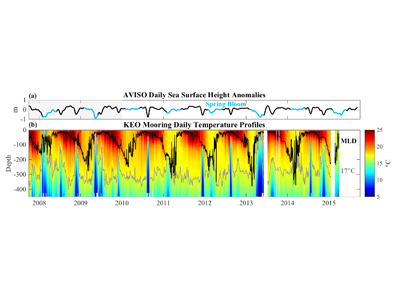 ~7 years of (a) AVISO daily sea surface height (SSH) anomalies and (b) upper-ocean temperature from the NOAA Kuroshio Extension Observatory (KEO) surface mooring. Black and gray lines in b show the mixed layer depth (MLD) and 17C contour, respectively. Spring bloom periods are indicated in blue in a. The semi-regular upwelling of cold water and corresponding depression of SSH is caused by cold-core eddies that pass the KEO mooring. Winter ventilation depths increase by ~100 m after 2010 when the extension jet entered a stable phase. To better characterize carbon cycling in this region, ~7 years of daily-averaged autonomous CO2 observations from NOAA’s Kuroshio Extension Observatory (KEO) surface mooring were used to close the mixed layer carbon budget. High rates of net community production (NCP; >100 mmol C m-2 d-1) were observed during the spring bloom period, and a mean annual NCP of 7±3 mol C m-2 yr-1 was determined. Biological processes near KEO largely balance the input of carbon that occurs annually through winter mixing; however, physical processes that deviate from climatology were not resolved in this study. Therefore, it remains unclear how transient features such as eddies influence biological carbon production and export through altered nutrient supply and active vertical transport of organic material. Further work is required to determine how biophysical interactions during mesoscale and submesoscale disturbances contribute to local carbon cycle processes and variability in regional mode water carbon inventories. Ocean Carbon Hot Spots, an upcoming workshop focused on understanding biophysical drivers of carbon uptake in WBC regions, will be held September 25-26, 2017 at the Monterey Bay Aquarium Research Institute (MBARI) in Moss Landing, California. The primary objective of the workshop is to develop a community of observationalists and modelers working on the topic, and to identify critical observational needs that would improve model parameterizations. Ocean Carbon Hot Spots will be co-sponsored by US CLIVAR, US OCB, MBARI, and OMIX.